Bedridden elderly, whether they are in that state temporarily or for the long term, can really benefit from the kind of help a home caregiver can provide. Being a caregiver can be challenging but some simple measures will not only ease their job but also ensure elderly loved ones are well cared for during those times when they are particularly fragile. What are the signs that need careful attention for bedridden elderly? Developmental milestones of each child are unique and develops at her/his own pace. Many parents worry a lot about their child and the time when the child should be achieving these milestones. Parents can educate themselves about the milestones and the opportunities for treatment and intervention in case of any disorder. Whether a child has a developmental delay or disorder, early identification and intervention are essential for achieving the best possible outcome. I think this quote very appropriately fits one of my patients – Mr Anand Rai (Name changed for patient privacy). Mr. Rai (Or Rai uncle, as he prefers me to call him) is 71 yrs old retired Engineer who was diagnosed with Chronic Obstructive Pulmonary Disorder (COPD) about thirty year back! When I first saw him for consultation, I was looking at a very tired, breathless and weak looking old man. Despite his many difficulties, he seemed to own an amazing ‘spirit’, a great ‘will’ to get better and a beautiful ‘smile’ on his face. I was told that Mr Rai had an episode of severe breathlessness, excessive sweating and total black-out one month back, when he was shopping for vegetables. He was immediately taken to the hospital, and admitted there for a week. He had been home bound, since then. After month-long restrictions, due to severe breathlessness and lack of endurance, he was now even scared to go out! Imagine the mental condition of a person, who loves outdoors, travelling, socializing, but because of his condition, is restricted to his house. I still remember his first words to me, “Dr. Kashmira, please make me better, so that I can go out and enjoy the rains when it comes and take a walk in the garden independently.” Another significant factor in his history was that he was a chain smoker for over 30 years, and still smoked 4 cigarettes a day. Further assessment and observation revealed that he had very-less to no air-entry in the lower zones of his chest. The whole chest was filled with congestion. His overall endurance was very poor, the sputum was greenish yellow in colour, which meant presence of infection in the lungs. All these factors together contributed to severe breathlessness, which could happen even when he was JUST SITTING, without doing any activity! After further (simple) tests and viewing his reports, I discussed his treatment protocol with him. I have always felt that a patient should be an active participant of his treatment protocol, he should know what his condition is, what protocol we are following for him and how will he benefit from that. His whole and sole goal was to go out for a walk. Even though this seems quite simple to us, imagine how difficult it would be for a person, who cannot walk even a few steps without halting to catch a breath. But what is life without a few challenges in it?! We started working towards our goal together. main culprit for his severe breathlessness – accumulation of secretions in his chest. So, I started with a combination of steam, Chest Physiotherapy, positioning for the patient and various other techniques. In the next few days, secretion had come down a bit, but the process was painfully slow. But as the saying goes, ‘Slow and steady wins the race’, we continued. And soon his secretions were under control, he was able to move with minimal breathlessness within the house. Our next challenge was to improve his endurance so that he would feel less tired. So we started with endurance training and secretion removal on alternate days. There were many ups and downs during the therapy. One such incident was when, his friend visited him at his place, and they were chatting continuously for hours together. And when I met him the next day, I was shocked to see him again severely breathless; I felt I will have to start all over again from ground zero. But luckily his condition improved the next day, when he sincerely followed my instruction of not talking the whole day, unless absolutely necessary. He still laughs till date, remembering the stern expression on my face. Finally after 20 sessions of therapy the day arrived when, it was time for him to step out for a walk, I still remember the joy and also the anxiousness on his face. Before we went downstairs together, I gave him a few important tips, and simply asked him to believe in himself. And we did it! He was able to walk with minimal breathlessness inside the building compound and he was able to climb the stairs as well! I continued the therapy for 10 more sessions, because we still needed to improve his endurance during walking and stair climbing. On 30th session, I discharged him, I still remember the words he said to me that day, “Dr. Kashmira, I don’t feel like calling you a doctor.” A bit confused I asked him why. He answered, “I feel like calling you ‘beta’, because now you’re like a daughter to me.” And I didn’t know how to reply to that, so I just smiled. Contributed by Dr. Kashmira Khedgaonkar (PT). She is an ever smiling Physiotherapist with ReLiva Physiotherapy & Rehab ( www.reliva.in ) who has a special trait of gaining confidence of the toughest of people. She deserves it rightly so, with her skills to put her learning to practice to enable their recovery. 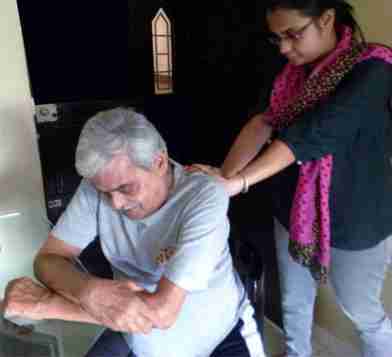 DISCLAIMER: Picture of Pulmonary Physiotherapy session does not represent the patient in the story and used for representational purpose only. 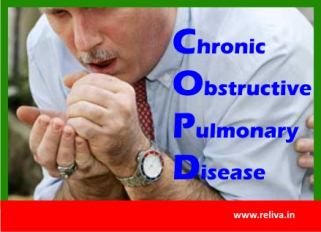 Most people have no idea that THIS is what patients of Asthma and COPD have to face during acute episodes of breathlessness. Read on to discover how he got back to his everyday life ! If you know a fellow Asthma/ COPD fighter, please SHARE this story.